Eluding the rain…enshrouded in the fog…. | Vermont Paddle Pups! Eluding the rain…enshrouded in the fog…. The long holiday weekend forecast was not inspiring…mostly rain, and some thunder to be heading our way. However, we managed to be selective in our timings and destinations, and were able to get in a few hikes, one climb, and a lovely paddle. On Saturday, we climbed a small peak, starting in the sun, but descending in a steady sprinkle. Gryphon and I had been up to this point earlier in the week, on a glorious sunny day. Of course, when we brought Edgar and his dad up the trail, we had less than ideal weather. Still a nice workout, and the dogs had fun. The sunny hike…only negative was having to use the tick remover for the FIRST TIME EVER! Yuk, we’ve never had ticks before…. Edgar did not have the sunny view on this day, and he got nice and wet and smelly! 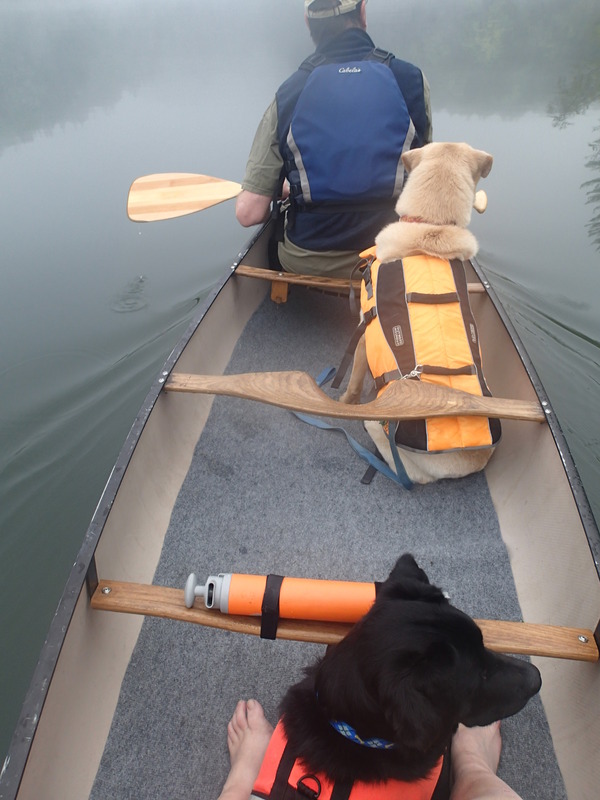 We were able to get out for an early paddle on Sunday, while the fog still rested upon the lake. We saw the loons for the first time this season, and also saw Great Blue Herons, and a beautiful Osprey . We made a hot breakfast ( JetBoil stove, we love it!) on a rocky outcropping, which is unfortunately often the hang-out for some inconsiderate jerks. Since the weather had been “iffy” all weekend, no one had been camping here..but we did find quite a bit of trash (broken glass, cans,bottles, sharp metal shards etc) ; we collected it, and will submit a trash data survey card. 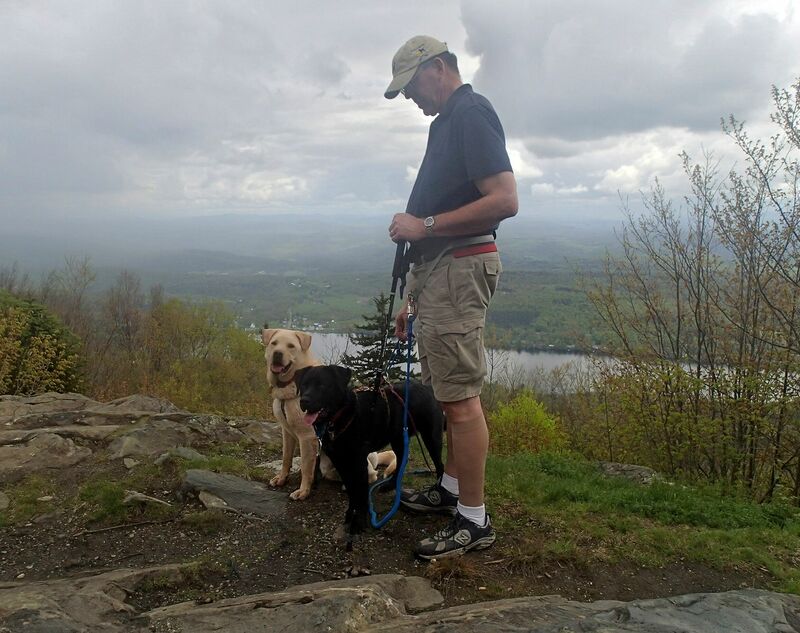 Seeing how some folks can ruin such a beautiful spot , and make it dangerous for our dogs, confirms our belief that it is a good thingthat our state’s Forest and Parks agency is going to begin to monitor this area. On Monday,we traveled a bit to visit family in NH. There is a 26 +/- mile trail network around the town. 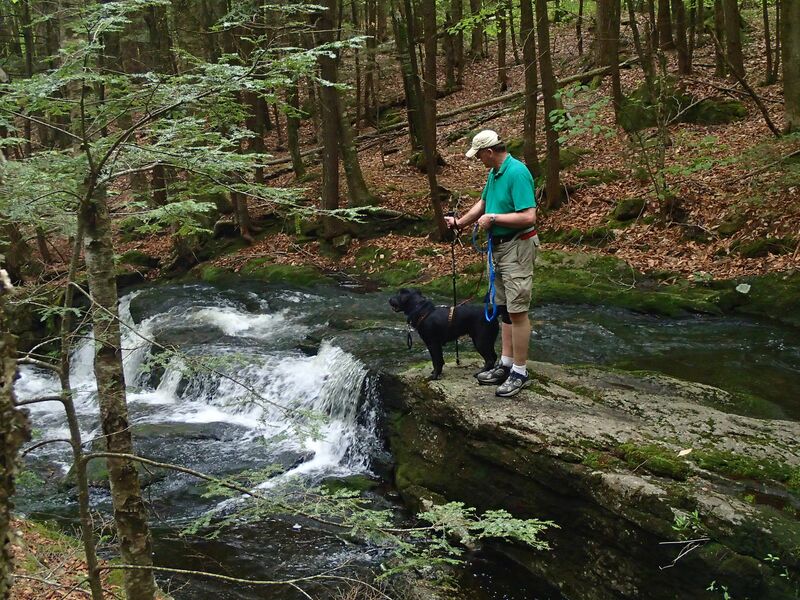 Today, we decided to hit the Cascade Brook Trail, since a 3 mile hike to see waterfalls is a good option on a day when the weather is threatening. 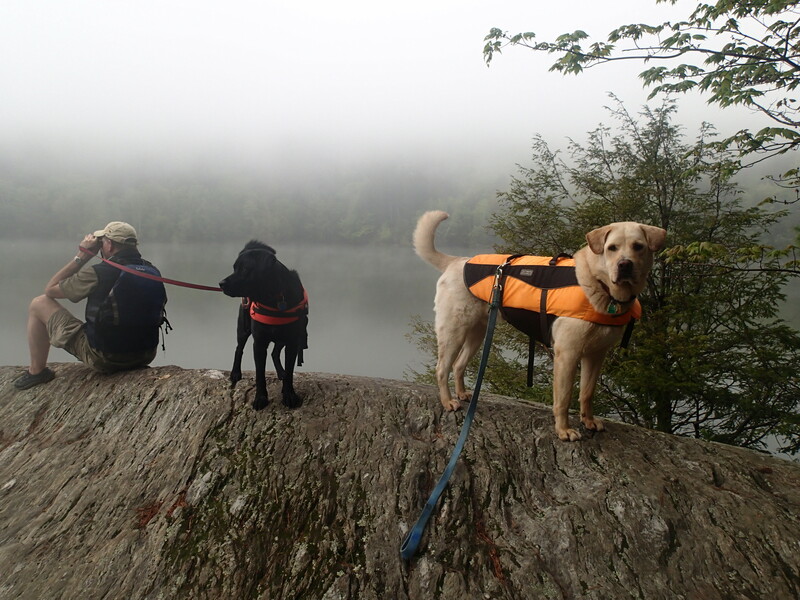 The dogs loved the opportunities to splash, and the weather held off just long enough for us to finish our hike. The trail commission has a program in which you can earn a patch, for hiking all 26 miles….I thought that would be neat, and that Gryphon can earn one too! However “due to the inconsiderate actions of a few dog owners” (as the posted sign says), one section of the network is now closed to dogs. 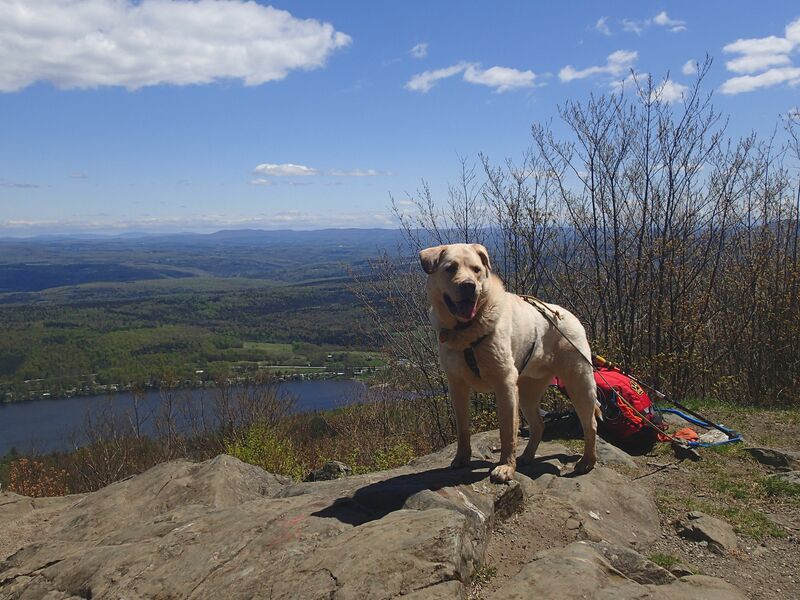 It would be no fun to earn the patch without my hiking buddy at my side…so I guess we’ll pass on that program. 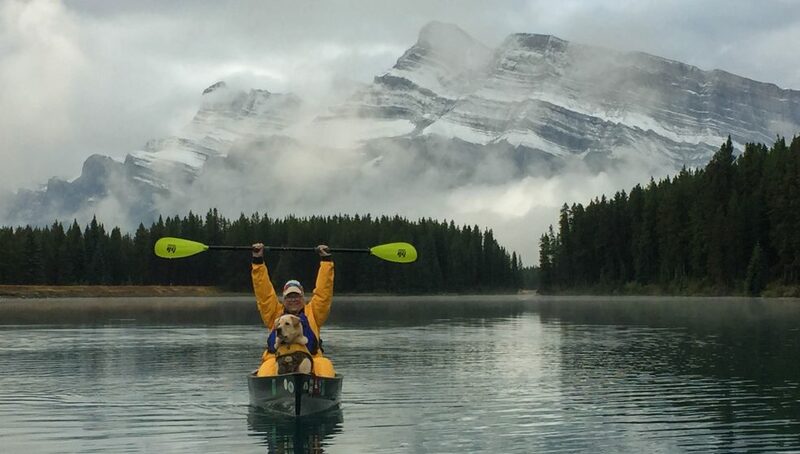 So, now that we have had a few shakedown cruises in the boat, the dogs and we are ready for some overnight canoe camping….stay tuned, for further reports!